Every year millions of workers in the United States experience injury due to occupational injuries. Worker's Compensation is a state run program to assist employees injured at work. These injuries can range from neck and back sprain/strains, to disc herniations, pain in the extremities, and in some serious cases even paralysis or permanent damage to the body. Chiropractic is beneficial to the recovery of most of these types of injuries. We work with patents injured on the job. We help patients with non-life-threatening workplace injuries get back to performing their jobs. Recovering from workers compensation injuries. Chiropractic care is a non-invasive form of treatment that helps promote healing. Chiropractic care and treatment can be very helpful in relieving low back or neck pain and stiffness resulting from a work injury, including disc injuries, sprains and strains, and degenerative conditions. Employers must carry workers compensation insurance to protect their employees if they should be injured on the job while performing their duties. If you become injured at work, as the employee, you have the exclusive right to choose your treating physician(s). In workers’ compensation cases, all necessary medical treatments and hospitalization stays or services are provided by either the employer’s insurance carrier or the employer. 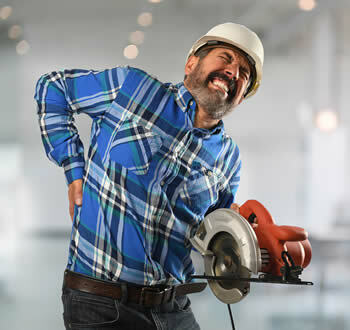 On average, one in three workplace injuries involves musculoskeletal injuries, which affect ligaments, muscles, tendons, bones, and in the most painful situations, nerves. These injuries can occur due to trauma or wear and tear from daily routines. Many people who experience these types of workplace injuries are potentially suitable candidates for chiropractic care. Doctors of Chiropractic are trained to perform a variety of different techniques including manual manipulation of the spine (i.e., adjustments) as well as massage and electrical stimulation of tissue. Chiropractic care helps reduce tissue inflammation caused by injury, and it also helps reduce pain caused by many workplace injuries. Chiropractic care is an attractive alternative to the use of narcotic painkillers, which can lead to dependency and abuse. Doctors of chiropractic can suggest therapeutic exercises that may speed the healing process in some cases and also prevent future workplace injuries such as overexertion, by teaching proper lifting techniques.